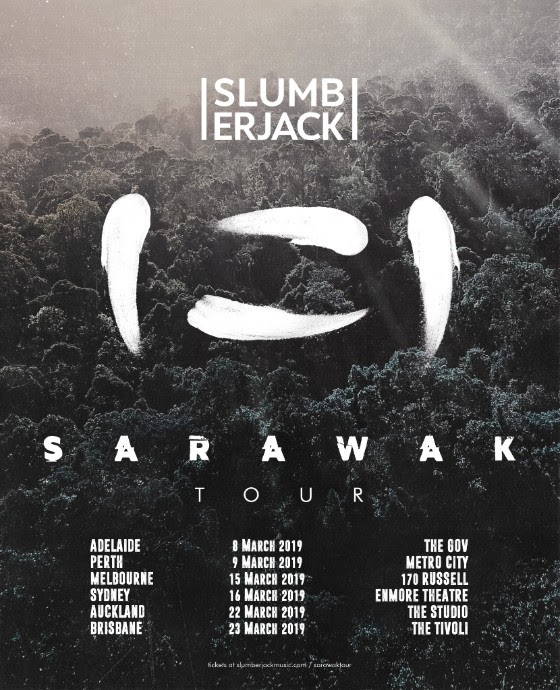 Western Australian heavy weights, SLUMBERJACK are back with their collaboration rich EP, SARAWAK. Machine Age, Claire Ridgely, Troyboi and Ekali each make an appearance over SARAWAK’s five track listing. SLUMBERJACK’s artistic aptitude is on full display throughout SARAWAK’s grand structure. ‘Daggers’ a collaboration between SLUMBERJACK and Machine Age opens the EP’s impressive track listing with a hybrid indie rock, and electronica concoction. ‘Athena’s sleek package returns to producers’ roots of towering trap compostions. ‘Hide and Seek’ featuring Claire Ridgely maintains SARAWAK’s lofty progression. SLUMBERJACK and Troyboi’s ‘Solid’ is certainly a favourite with it’s strident soundscape and sweeping stems. Closing the EP is ‘Closure’s electronic anthem ensemble a collaboration between Ekali and the Western Australian powerhouses. SLUMBERJACK’s SARAWAK EP is a testament to the power of collaboration and expert production. I can’t wait to see SLUMBERJACK on tour throughout March.